TFI specialises in customised flow-field measurement systems, both software and hardware. Depending on your requirements, we can integrate a range of instruments into a complete data acquisition and processing system, controlled by a single user interface. This streamlines your running procedures, allows simultaneous sampling of all required instruments, gives consistent data storage formats and simplifies post-processing requirements. 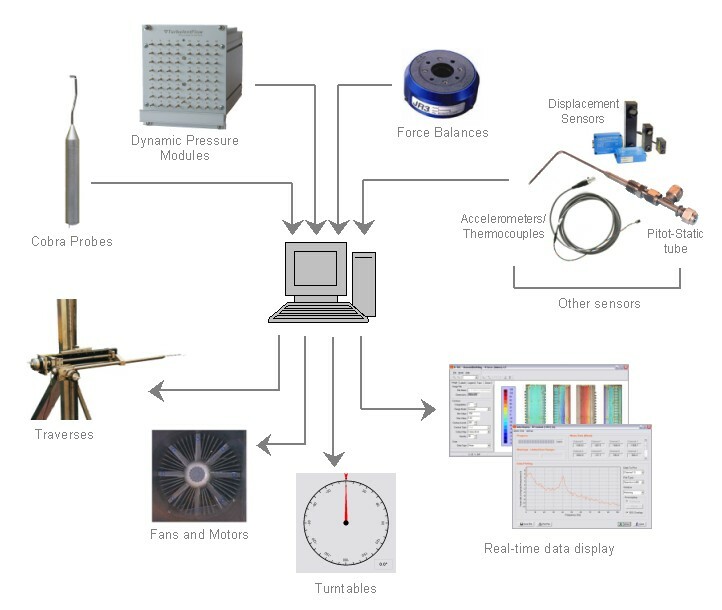 The TFI Device Control software currently supports inputs from a wide range of TFI and 3rd party instrumentation, including pressure measurement systems, Cobra Probes, force balances and other sensors. Equipment controlled by the software includes fans, turntables, traverses and calibration equipment. By combining control and data acquisition, automated testing is possible. The software can be extended to support other instrumentation and equipment as required. For jobs that are performed many times over, custom processing may be able to be incorporated into the data acquisition package itself. We are also able to provide custom hardware for the simultaneous connection of a wide range of equipment to the data acquisition system. To discuss your requirements, contact us for further information.